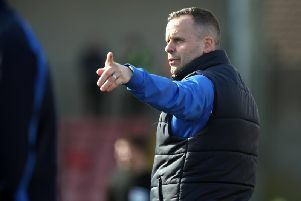 Coleraine boss Oran Kearney admitted he was a tinge disappointed as his side drew 1-1 with league leaders Crusdaers in Belfast on Tuesday night. The Bannsiders, two points behind the Danske Bank Premiership leaders going into the crunch game,had taken the lead through a Jamie McGonigle penalty on 67 minutes. But David Cushley ensured the Crues remain two points clear with an equaliser five minutes from the end. Kearney said: “When go into the last 10 minutes in a game of this magnitude with a one-nil lead, it’s perhaps disappointing we didn’t see it out. “So we are a little disappointed we didn’t leave with all three points. “Their goal was probably the only time we didn’t defend a set-piece properly all night. “We knew that’s what Crusaders are good at. They are always dangerous from set plays. “But it was a brilliant game, just what I expected. “For our lads, it was another great experience and another important learning curve to perform in such a hostile environment. “To a man, they boys were brilliant. My message to them now is there is a huge amount of football left. We are trying to chase down a league title, so we don’t expect it to be handed to us. “Sometimes you have to go through the mill and do it the ugly way. It’s all about mentality at this stage, but we are prepared to take it right to the wire. Crusaders boss Stephen Baxter insisted Cushley has the knack of grabbing vital goals. “Cushley has got that about him,” said Baxter. “A lot of his goals come quickly when he gets on to the pitch. “He’s inclined to get shots away when he can. I knew he would get chances within the first five minutes of being introduced. “I told the boys not to panic because we had a good 15 minutes left to get the equaliser and maybe even a winner. “We had all the big chances in the second and are a little bit disappointed we didn’t get over the line, but the reality is when you are one-nil down with 15 minutes to go, you’d take a draw all day long. “There wasn’t enough football played . . . the technical players didn’t really get on the ball.